A pegboard for the garage is an excellent example storage solution. The five best peg boards are reviewed and compared. A garage pegboard will make a massive difference when it comes to tool organization, and makes a great accompaniment for a metal shelving unit. You can choose from among a variety of different examples - plastic peg boards, aluminum pegboards and more. You can also opt for large or small sized boards, which allows for a lot of scope and different storage solutions. Generally they come as wall panels, though for those with a limited amount of space, you can choose to purchase smaller pegboard kits, that consist of a set of rails and accompanying hooks. Whichever option you go for, the five best products are featured below - all are the best selling examples in their category and all offer the best overall value for money. This is the best selling garage pegboard overall and it's certainly lives up to it's product name. Like a bulldog - it's incredibly durable and is capable of holding a variety of hand tools and associated accessories. There's enough hard-ware to hang it on either a drywall or a studs and at eight foot long - you get plenty of space to hand all your most commonly used tools. The unit comes in panels, constructed out of heavy duty plastic, all of which easily slot together to create a seamless looking peg board that can hang bins and tool pegs without the need for specifically placed spacers. You get to customize according to your own requirements and overall - it's worth every cent of the incredibly low price tag. This is the best selling metal pegboard and it's certainly built to last. Manufactured from galvanized steel, that's 20 gauge, treated against future rust issues and largely scratch resistant, it's the one to purchase if you're wanting a 100% tough as nails type of peg board. You can hang it easily enough from either a stone face or studs, and flange (3/4" deep) keeps it from having contact with the surface it's mounted on. The board comes complete with all the hanging hardware and the holes will take any type of 1/4" peg board hooks. Also available in seven different colored finished, the steel board will more than suit a garage workshop or industrial environment. This is a top quality steel pegboard organizer that's 100% perfect for an industrial environment. This one comes complete with a good range of pegboard accessories - three bin hangers, one hammer hanger, one screwdriver hanger, a further selection of hooks and of course the required hardware for wall mounting the board. The board is galvanized for extra strength and it's big enough (once mounted) to hold a fair amount of hand tools and accessories. Another handy feature is the fact that it's magnetized - you can pin lightweight items to the board with standard magnets. Overall, a good looking, hard working peg board - versatile, right on the money and good for both home and workshop use. 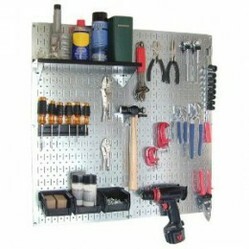 This is the best large garage pegboard and will once again be suitable for a range of uses - hobbies, professional workshops, garages and garden shed storage. Solid galvanized steel construction, this one provides in excess of ten and a half feet of wall storage space. Like the previous product, this one also include a screwdriver hanger, one for a hammer, a variety of bin hangers and hooks, plus enough wall hanging hardware to mount it safely and securely to either studs or stone faced walls. It's also powder coated, adding to its finished look and assembly/mounting is a breeze. Bags of quality, big discount, great all rounder. The final garage pegboard is the largest by far and will certainly provide masses of wall storage space for those looking to bring order to a variety of hand tools, power tools and associated accessories. Customizable - this one will mount on either studs or a solid wall, and can form part of a larger professional workshop style storage solution. Galvanized, designed to stand up to heavy duty wear and tear, it's pretty simple to connect and mount and comes with all the required wall hanging hard ware. It also include a fairly decent array of pegboard accessories - tool hangers, hanging bins, racks, basic hooks, medium hooks and much more. An awesome wall storage solution, worth every last cent and works out a lot cheaper than purchasing a pro wall-system.